Attendees: From the Forum – Ian Bond (co-chair) Nick Brown (co-chair), Christina Walsh, Cllr. Barry Anderson, Cllr. Caroline Anderson (Secretary), Lawrence Tewfik, Francis Garbutt, Grace Clark, Sarah Rushton, Paul Simkins. From residents: 36 residents attended in addition to those named above. Ian Bond (co-Chairman) welcomed everyone to the meeting. He explained the Adel Neighbourhood Plan Policy Intentions document and the questionnaire that accompanies it. Ian outlined the sites that may be available for housing. He talked about the A660 and how busy that road is without any new development in Adel or its neighbouring villages. In respect of the land opposite the church Heritage is still an issue. It is important that we press developers for the type of housing we do need, not just 4/5 bedroomed family homes. Nick Brown (Co-Chairman) explained the Concept Plan which everyone had a copy of within the Policy Intentions document issued tonight. Each area is defined with the key as to what type of land all the parts of Adel fit within. A number of questions were put by the residents in attendance. Ian explained that the Plan is not just about housing it is about a number of other things as well e.g. Community Facilities. Ian asked Cllr. Anderson to update those present on the provision of school places in the area. •	Traffic – this is a key issue for everyone. •	The Objectives within the Plan document in terms of green space are not translated in the objectives. Ian explained that the much larger document which is what residents will be voting on will contain much more detail. •	Tone of the document – some residents would like to see the tone of the document strengthened as people are very passionate about the area. 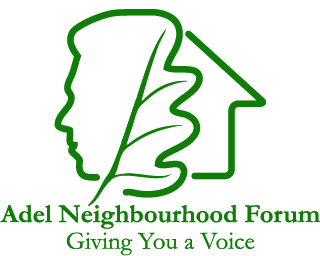 The next meeting of the Full Forum will be 23rd September at 7.30pm. Have your say on the Policy Intentions Document now being delivered to #Adel households. Please complete the Feedback form. Thank you.